As an environmental stewardship organization, a site-sensitive approach for the building's placement on the land was imperative. Leaving the majority of the 80 acre site undisturbed for hiking trails, as well as to protect existing plant and animal habitat, was an essential consideration. 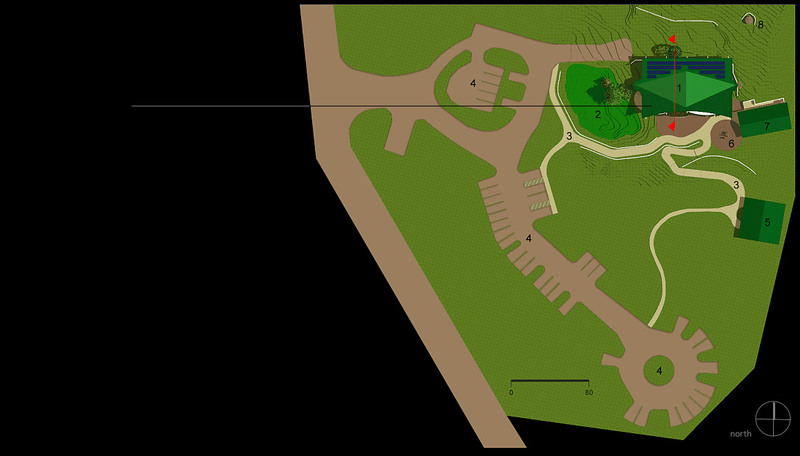 A small clearing near the existing structures and parking lots, with favorable solar access, and an east-west orientation (for passive solar optimization) was ultimately chosen for the Learning Center building pad. Plan at right shows only the developed portion of 80 acre property (approx 6 acres). NOTE: Site is heavily wooded– not all trees are shown.